Milton Snavely Hershey (September 13, 1857 – October 13, 1945) was an American businessman and philanthropist. He is famous for founding the Hershey Chocolate Company, which became one of the largest and most famous candy companies in the world. He also founded the company town of Derry Township, Pennsylvania, built to house his workers and provide a good living environment for them complete with parks and recreational facilities, schools, churches, and a hospital. It was later named "Hershey" in his honor. 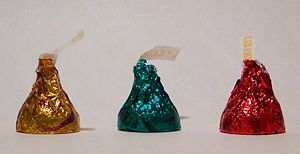 Hershey's chocolates became world famous, particularly the signature "kiss," which Hershey introduced in 1907. Hershey's life is an example of the "American Dream," as, with persistence, he rose from poverty to success and wealth. Hershey did not succumb to the temptations of power and riches, however, but rather spent his time and money on his family and on improving the lives of those who worked for him. Milton Snavely Hershey was born on September 13, 1857 on a farm near Derry Church, in rural Dauphin County in Pennsylvania. His parents, Fannie Snavely and Henry Hershey, of German and Swiss heritage, were members of Pennsylvania's Mennonite community. Milton’s mother raised her son in a strict discipline of Mennonite faith. His sister Serena died in 1867, at the age of five. Hershey’s father was an entrepreneur, however not a successful one. Most of his endeavors to make money for his family ended up in failure, what caused lot of stress on young Milton. He dropped out of school in the fourth grade, and on his father's initiative, started an apprenticeship with Samuel Ernst, a Lancaster printer who printed publications in German language. Milton, however, had no interest in printing, and soon returned back home to his family. In 1872 Hershey’s mother arranged for her son to start an apprenticeship at the Lancaster confectionery shop owned by Joseph Royer. He liked the job so much that he decided, at the age of nineteen, to open his own candy business in Philadelphia. His mother and her sister provided moral and financial support for the business. In 1880, a family friend, William Lebkicher joined Hershey as a bookkeeper, and from then on played a significant role in all of Hershey’s endeavors. However, despite everything, Hershey’s business failed, and he returned back to his family. He joined his father to a trip to Colorado, where his father tried, again unsuccessfully, to mine silver. In Denver, Hershey worked for a candy manufacturer who taught him some important lessons on how to make candy, especially the importance of fresh milk. Upon his return home in 1883, Hershey decided to try again to open the candy business, this time in New York City. His shop was located on Sixth Avenue, between Forty-second and Forty-third Streets. However, due to harsh competition and insufficient capital, his business failed again. He returned home to Pennsylvania, shamed in front of his family who suffered the loss of funds invested in his business. With the help of his friend William Lebkicher, who lent him some money, Hershey started making caramel candies. This time he had luck. An English importer of candies was so impressed by the taste and quality of Hershey’s caramels, that he made a large order of caramels, one that made Hershey enough money to launch his caramel-manufacturing business. His Lancaster Caramel Company was opened in 1894. He also started to bake chocolate and cocoa coating for the caramels, under the name of the Hershey Chocolate Company. His business started to flourish and Hershey soon became one of the most successful businessmen in Lancaster and a millionaire. He traveled around the world to visit different caramel factories and learn new methods of making candy. In 1891, he purchased a large mansion in Lancaster and started to socialize with famous people. In 1897, he purchased the family homestead in Derry Church, where he was born. In 1898, at the age of 41, Hershey married Catherine Elisabeth Sweeney. The marriage came as a surprise to his family, for Catherine was of the Roman Catholic faith. The couple settled in Lancaster, where Hershey lived with his mother. Milton and Catherine traveled around the world, and enjoyed a happy and loving marriage relationship. Around 1900 Hershey decided to turn to the chocolate business. He sold his Lancaster Caramel Company for $1 million, and built a chocolate factory in Derry Township. The area was perfectly suited for the factory, with plenty of dairy farms in its vicinity. By the mid-1900s the factory and Hershey’s new mansion were completed. Hershey provided his employees with a beautiful environment, large parks, and gorgeous public gardens. He built a whole city surrounding the factory, and the company helped its employees to build their own houses. The town was named “Hershey” in 1906. Hershey's Kisses filled with Caramel. In 1907, Hershey introduced a new candy, small flat-bottomed conical-shaped pieces of chocolate that he named "Hershey's Kisses." Initially they were individually wrapped by hand in squares of foil, and the introduction of machine wrapping in 1921 simplified the process while adding the small paper ribbon to the top of the package to indicate that it was a genuine Hershey product. The product went on to become one of the most successful and well-known products ever produced by the company. In 2007, in a rare embrace of a commercial product on a first-class stamp, the U.S. Postal Service marked the one-hundredth anniversary of Hershey's Kisses by placing an image of one on its Love Stamp. Milton and Catherine Hershey were unable to have children of their own. They decided to establish a school for orphaned boys. Hershey turned over his birthplace, which was near the factory, to serve as a home and school for the boys. The school was named the Hershey Industrial School (later known as the Milton Hershey School). Hershey’s wife Catherine died on March 25, 1915, after long and debilitating illness. Hershey tried everything to save her life, and invested much of his fortune to find a cure for her illness. After her death, he continued to focus his life on business. During World War I he started to produce his own sugar in Cuba, compensating for the lack of sugar coming from Europe. His factory continued to produce chocolate even in the time of Great Depression. He even expanded the production, providing jobs for new workers. He built a hospital, dining, and recreational facilities, and a theater. By the end of his life Hershey started to withdraw from active duty in his company. He however continued to live a rich social life. Biographers from all over the nation started to write about his life, typical of the “American dream.” Even the American Rose Society named a rose in his honor. During World War II, despite his advancing years, Hershey engaged in support of the troops. He encouraged the research of a special chocolate that would not melt in a hot weather, so that the soldiers could eat it wherever they were. Hershey and the Hershey Chocolate Corporation were awarded an Army-Navy “E” flag for their war effort. Milton Hershey died on October 13, 1945 in the Hershey Hospital in Pennsylvania. Hershey rose from poverty to become one of the most well-known, successful people in the world. He founded the Hershey Chocolate Corporation which at one point was the largest and most famous chocolate manufacturing plant in the world. Surrounding the plant, Hershey built a town and developed the whole region. He cared for the needs of his employees, giving them not only a healthy and beautiful environment for work, but also a place for recreation. He built parks, gardens, a sport center, amusement park, swimming pool, churches, and a trolley system. He founded the Hershey Industrial School and the Penn State Milton S. Hershey Medical Center. The hospital today is a teaching hospital and is part of the Pennsylvania State University. Coyle, M. L. 2006. Milton S. Hershey. Hershey - Derry Township Historical Society. Retrieved March 23, 2007. Hershey Entertainment and Resorts Company – Website of Hershey company. Invention of the Hershey's milk chocolate bar – How Hershey found the recipe for Hershey chocolate. This page was last modified on 8 October 2018, at 18:42.